In the course of the project “Football for Equality” Sensitisation Workshops were organised to broach the issues of discrimination, integration and stereotypes . The workshops took place in Austria, France, Italy and Slovakia. An internet tool-kit collects information about this issues for the youth. “How integrative is football?”, this question was posed at the Sensitisation Workshop in Vienna. Vienna was not the only location carrying out the programme positioned by “Football for Equality” as four partners of FARE arranged workshops in their local setting: FairPlay-Vidc in Austria, UISP in Italy, LICRA in France and Ludia Pori Rasizmu in Slovakia. The different workshops covered different topics. The Austrian FARE-partner FairPlay-Vidc arranged a meeting about the possibilities of integration through football. The workshop took place on December 13th 2010 and was organised in partnership with the Vienna Football Association (WFV) and the UNESCO Commission. 70 participants joined the public event in the Vienna Central Library, among them were members of ethnic minority clubs, football administrators, players, coaches and fans. Prominent guests participated in the Sensitation Workshop as well: Robert Sedlacek, president of the Vienna Football Association, Gilbert Prilasnig ex-player of Sturm Graz, Mustafa Iscel, president of the Vienna Türkgücü SKV and Emmanuel Ekeigwe, founder of the New African Football Academy (NAFA) in Vienna. Miriam Hie, announcer of Servus TV, moderated the debate. After the first workshop, FairPlay organised two more meetings in cooperation with the Austrian Football Association (ÖFB). And that with the goal to raise awareness on racism and discrimination. The meetings were held on January 12th and February 4th 2011 and were chaired by the General Secretary of the Austrian Football Association. Apart from the key staff of the ÖFB, administrators and managers of both the Viennese football clubs Rapid and Austria were attendant. 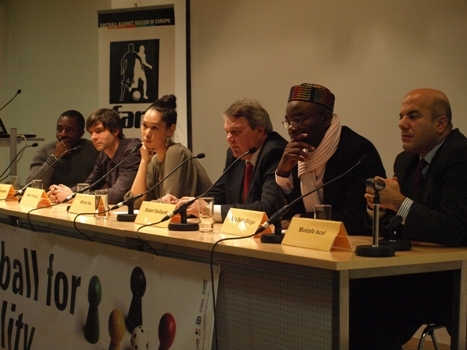 On Mai 6th 2011, FairPlay was invited to a workshop on anti-racist behaviour of social workers. The workshop was organised by the youth department of the Viennese municipality: wienXtra. Here, the Austrian FARE-partner was asked to pass on his expertise on discrimination. So FairPlay gave practical examples of reactions, when racism occurs in everyday life. More than 50 youth-, social- and street workers listened to the instructions, shared their own experiences on that topic and established an anti-racist guideline. Afterwards they got information and campaign material of “Football for Equality”. Ligue Internationale Contre le Racisme et l'Antisémitisme (LICRA) organised two workshops. One took place in Bordeaux, where 40 people joined the meeting. Most of them were police forces specialised on the work in sporting venues, especially in football stadiums. LICRA instructed the workshop with the presentation of their own work in football and continued with the relation of football and government bodies. In the next phase of the workshop, LICRA gave advise about the recognization of racism, homophobia and violence and the legal means to face this forms of discrimination in the stadium. After that, the police forces shared their own experiences on these problems. The workshop has born fruits, most of the police forces said, that they were not really aware of the problems of discrimination. On February 8th, the second French Workshop took place in Lille. About 60 people were attending, among them were the local chiefs of the special stadium police force and experts on hooliganism. First of all, LICRA presented a sum up of the Sensitisation Workshop taken place in Bordeaux. On the basis of this information, the organisers answersed the questions of the participants, also a lot of people from the French media listened to the question/answers session. In the course of the Mondiali Antirazzisti 2010, the Antiracist World Cup, in Casalecchio di Reno near to Bologna, another Sensitisation Workshop took place. The 30.000 participants of the Mondiali came from various backgrounds, they were mostly football fans, people with relation to football or interested in the topic. Here, the UISP focused their workshop on the “Deconstruction of gender stereotypes”. Experts from university contexts, lesbian-gay-bisexuell-trans-groups (LGBT) and women’s groups from Italy and England hosted the workshop. The satisfying amount of the workshop was that the hidden issues of homophobia und sexism were discussed intensively and claimed to be put on the agenda explicitly. The last Sensitisation Workshop took place from April 8th to 10th 2011. In the course of the Closing Meeting of the project “Football for Equality”, the FARE partner Ludia Proti Razismu organised the seminar. It was located at the Ústav Vzdalávania a Sluzieb, the centre for education and studies, in the Kramáre district of Bratislava. Among the 35 participants, there were Antiracist NGO’s, roma groups, fan’ initiatives, football bodies and LGBT groups. While the first workshop focused on the inclusion of Roma through football, the second one was dedicated to the fight against homophobia. The event was given a sum up on the situation in Central and Eastern Europe with regard to both issues. Here, Irena Biháriová outlined the role of football for integration: “Where people are not judged based on their origin or the colour of their skin but by their performance and team play.” In both workshops the participants from various countries shared their experiences, expertise and exchanged good practice ideas to follow Biháriovás remark and to combat discrimination. The participants concluded that both issues are facing similar structural problems, in many cases roma and homosexuals are regarded as invisible minorities. Istvan Pisonts has also faced this problems, the Hungarian ex-player and youth coach is a role-model for young Roma, who do not admit their identify. The Roman had been playing sucessfully for prominent adresses in football like Honved Budapest, Eintracht Frankfurt or Hapoel Tel Aviv. Following up, the attendants presented potential projects and activities, especially with regard to the Euro 2012 in Poland and Ukraine. In the last session the continuing “Football for Equality 2” was presented. About 70 resources in 11 European languages – the Tool-kit of the project ”Football for Equality” offers a lot of material for young people on the issues, that were raised in the Sensitisation Workshop. The material includes teaching packs, short films, posters, comics, qiuzzes and competitions. The objective was to put information on projects into a searchable internet database, which is accessible for schools and for young people in grassroot groups and organisations. Since November 2010, the British FARE-partner Football Unites Racism Divides (FURD) is carrying the Tool-kit for young people, which in the beginning was mainly an English project. Meanwhile it has developed into a more international collection of good practice exmples on the topic of racism, homophobia and sexism. Most of the material deals with racism. Somewhat it can be critisized for its occurance of the topics homophobia and sexism. The more invisible forms of discrimination are hardly visible in the Tool-kit as well. The following project “Football for Equality 2” will work on this shortcoming.